One important thing that we know about divorce mediation in December 2018 is that we can work through the settlement issues with the knowledge of the current laws that are in effect. This includes the effect of the taxability or non-taxability of maintenance (alimony) and child support for separation and divorce agreements signed before 2019. I know general taxation principles as they apply to divorce and family law, as every experienced matrimonial lawyer and divorce mediator should. As always, however, I give a little disclaimer here and say check with your tax adviser, such as your Certified Public Accountant or tax lawyer, for tax advice as I do not give tax advice. Sometimes things seem to wind down a little for a Law and Mediation Office as we move towards the end of the year. People tend to want to deal less with their legal issues. Less court appearances are scheduled because of the holidays, holiday parties and vacations schedules. The same is often true on the divorce mediation side of things. So why does it happen? It could be that people do not want to deal with resolving their family law issues during the holidays. People also might want to save their money to spend on gifts, trips and otherwise. At times a couple might know that they need to move on from their marriages but want to keep it peaceful with the family until after the New Year. Others might want to wait to start their new lives and new resolutions in the New Year. Interestingly, I understand that the belief that January has the highest volume of divorce filings is a myth. Maybe people start working towards that in January, or soon after, but historically, according to an article in the Atlantic, August and March apparently have the most divorce filings. Just when I think I have things figured out, such as things ease up a little for this divorce mediator in December, then there’s a wave of new business because people have time off from work and can deal with personal issues or other reasons! But this year, there could be another reason people want to mediate their divorces now. The new tax law that goes into effect for the taxability of maintenance issues will apply to Separation Agreements and divorce settlements that are signed after December 31, 2018. But, for agreements signed in 2018, they will be grandfathered in so to speak and receive the benefit of the old tax treatment. Again, check with your tax professionals about it! Divorce mediation operates in the shadow of the law is an expression I learned in my mediation and collaborative trainings and believe it myself. What this means is that mediated divorce settlements do not need to be decided as a Judge might in a litigation, however, the parties to a divorce mediation can be guided by the current state of the law. For those who like the comfort of mediating with knowledge of the law and its implications could be a reason to tackle one’s divorce issues now. So, what do divorce mediations look like now? It looks much the same as when I wrote the blog article Is Mediation the Right Choice for my divorce? All my Long Island divorce mediation couples, thus far, have selected that the grounds for their eventual divorce (some couples stop at separation agreement) will be under the No-Fault law. This is contained in New York Domestic Relations Law Section 170(7) which is that if a marriage has been irretrievably broken for at least six months, then the parties are entitled to get divorced. It’s not the Husband’s fault nor the Wife’s fault, it is the marriage that is broken. Thus, the term “NO Fault”. The fault-based grounds still exist but it is the rare case, mediated or litigated, that settles upon a fault-based ground. Once a couple agrees that they will utilize the no-fault grounds they still need to discuss and reach agreements on all the other issues that need to be resolved in a divorce mediation. Usually I like to move to custody and parenting time first since several issues flow from there. The couple will need to decide upon residential and legal custody. Residential custody is where a child lives primarily. Probably the most common arrangement I see is a situation where the child resides primarily with one parent. Many, though, select a shared residential custody agreement. To me a shared residential custody schedule means equal parenting time with each parent. Legal custody is about decision making for the children. 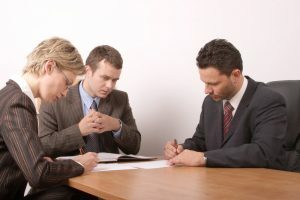 Joint legal custody, sole legal custody, joint custody with spheres of influence (different parents have final decision-making authority over categories such as health care, education, general social welfare, religious matters), and hybrids of the foregoing are all possible and can be discussed with your divorce mediator. Child support and spousal maintenance (alimony) is often a next topic of discussion. There are guidelines based on income for child support and maintenance. The guideline range for how long maintenance should last after the divorce is based on the length of the marriage. These guidelines, however, were made by the legislature in New York with the understanding that maintenance would be taxable income to the person receiving it and a tax deduction to the person paying it. Further, since the payment of maintenance raises the income of the recipient for the child support calculation and reduces the income of the payor this too impacts the child support calculation. For agreements signed before the end of 2018, this, according to the new tax law passed by the United State Congress at the end for 2017, will remain true. These agreements further will be grandfathered in, so to speak, moving forward in the future provided the proper language is used when these orders are modified. Now, what’s going to happen on New Years day 2019 and moving forward? The tax deductibility will change but the New York legislature has not changed the law as of the date of this blog. The truth is nobody knows yet how divorce mediations and divorces in general will be impacted in the future because it has not happened yet. The paying spouse might fight harder against paying maintenance because the tax deductibility will be gone. Conjecture about the future and actual examples of the changing state that divorce mediators need to consider will be the subject of future blogs. Equitable distribution of marital assets and marital debt, of course, is still a vital topic of divorce mediations in December 2018. Stay tuned for future developments. Feel free to contact my office to set up your initial consultation (up to a half hour of it is free). It would be our pleasure to speak with you about it.